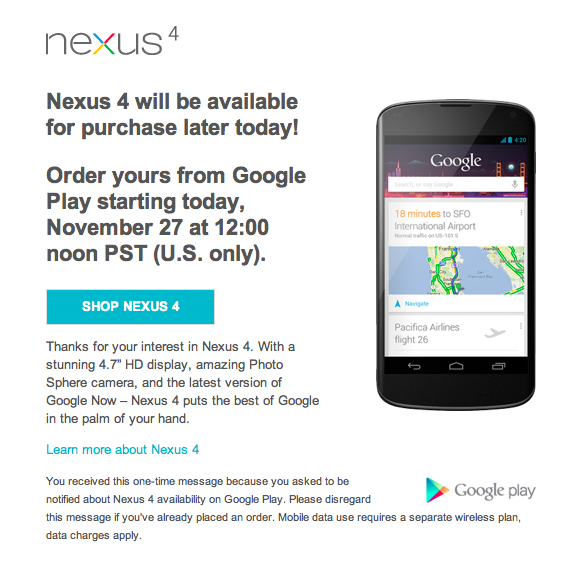 Google just sent out emails indicating the Nexus 4 will resume sales today at U.S. noon Pacific time. That’s pretty much it, at noon pacific time you should have your F5 button ready and your credit card already logged into Google Play. We hope that this time around Google is prepared for another massive influx of would-be Nexus 4 buyers and can keep up their order process ensuring everyone who wants one, gets one. As a secondary reminder for all you T-Mobile customers, the phone is now listed as back in stock on T-Mobile.com for $199.99 with a two-year agreement with Classic Plan. Better act fast today, before Google runs through their stock again and be sure to check our preview for early thoughts of the Nexus 4! i’ll be ready, again. hopefully not a repeat of the last time. Best phone ever. I’m ready with 2 computers using 50 Mbps -5ms ping- connection. Advise for Google Play shoppers. Set up your name, billing and shipping address and credit card info in Wallet/Checkout now. I was able to get mine at the 9 minute mark on the first batch. I think having this all set up in advance made my order process fater since I didn’t have to type it all out in the race against the clock. Good luck! Already have 2 nexus phones, What about the bumpers? 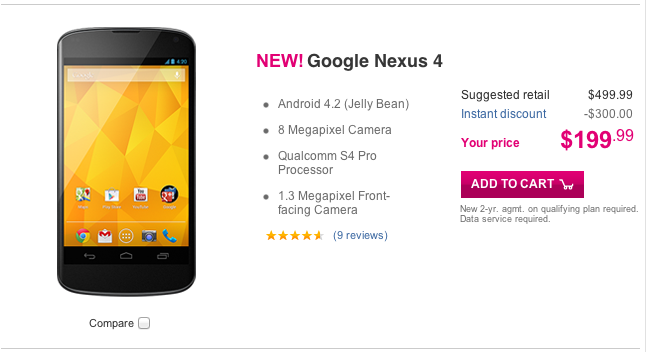 i made sure i got one when i ordered my nexus, it’s definitely a must buy! 12:00 PST means 2:00 PM CST, I am ready with my T1 connection. http://www.youtube.com/watch?v=ICzJa7yXrbA&feature=plcp watch my email that came in and yes prder it 30 mins before and keep refreshing your page! I’m happy it’s back. Which means based on another email i got yesterday mine grin 11/13 order will be shipped this week. Needy news ever. Who says resellers would only have 1 account and address? Ok smartass this will make it that much harder for them. They probably already have alternate ones… that is if they are experience resellers which could be the case. Useless comment as usual from you. Since it is already after the release date of the product, it would be too late for a “pre-order”. They are opening up ordering at 3:00PM. Everything has a start and end time so even if they did do a “pre-order”, someone would be in a meeting (or driving, sleeping, etc.) at the time that the website went live for it. Perhaps not technically a preorder, but a order queue that would fulfill orders in the order they were put into the system. That would be better than a mad dash for the product in a short window. As a classic member eligible for an upgrade, I’m unable to upgrade to this phone (at any price). The phone doesn’t even show up in the list of phones to choose from. You can only get the Tmobile discount through tmobile if you add a new line or are a new customer. Same here. However, I wouldn’t buy this phone through T-Mobile anyway since you can buy it off-contract for $350. I’ve been thinking about using my upgrade on a HTC 8X or some other future high-end WP8 device. Will the t-mobile version be kept from doing free tethering or would I need to get the phone from Google to get that? Anyone else trying to upgrade on tmobile.com and the nexus 4 not showing up? You can’t use a phone upgrade on an existing line to get the Nexus 4. It can only be done through adding a line or as a new customer. Ohh man, I won’t be near my PC at 2pm CT. Will try to get it at 130pm or hopefully they are not sold out once I’m back. I just called T-Mobile and they say it’s not in stock yet and not available. I’m not sure if this is just a run around they are telling existing customers, because it is available for new customers online. Frustrating…. Sold out in less than 1 minute. and I keep hitting F5. On the rare occasion when I get it in my cart, I get a demand error, and it’s pulled from my cart. And it’s 2:02 p.m. and it’s showing ships soon! i’m trying to order now. What a disaster. Tips to anyone, just keep refreshing your cart once its in there. then quickly check out. when its says “due to high demand in yellow’ i kept hitting proceed or i would hit the cart itself. wish i remembered what i did to actually get the item processed. 30 seconds after it posted and no Nexus…screw this. WTF did they get in 3????? Great… they were sold out within the 20 seconds it took me to try and place my order… Was refreshing the page up until 12 PM PST to make sure I was one of the first on this. Having the same problem. Although now I’m having issues even getting the item to stay in my cart…. Guess I’ll keep trying for a bit longer. Sold out within five minutes…. It’s Official…I HATE GOOGLE!!! Tried to get one again, was promptly on time, and within 1 and half minutes after going on sale they were sold out!! Ridiculous!! Tried to order it at 3:00 sharp, and there was an error due to high demand at checkout. Now it’s showing out of stock or it won’t add to cart. Anyone actually able to order it this time? I had it in my cart, clicked the order, and it was removed from my cart. as much as I don’t like Ticketmaster, Google should partner with them to learn how to do high-volume ecommerce. What a joke. I’ve added the 16GB to my cart ten times, only to have it removed ten times. Ha, yes, showed shipping soon for a few seconds, now Sold Out again. Really? Not another Google Fail?? It pops in and out of stock. If you are luck enough to add it to your cart, you click purchase, then it gives you a message about demand, then REMOVES IT FROM YOUR CART! Morons! Already sold out…wow! Glad I was able to purchase on launch date. Crap!! Sold Out in 10min. again.. ???? It showed 17 minutes on my end. Good thing my baby can wait until 2013 to get it. horrible!! it was on sale for 2 seconds then in my cart then server problems!!!! LMAO!, damn sold out in seconds, I think maybe it’s a sick joke by google or hackers are doing something to the site to buy up all the phones in order to resell them for profit, sometimes they do it on ticketmaster, you just keep getting errors. I just want the bumper for my nexus! keep trying you guys. i just got through with an order for two a few minutes ago. Got one 4 and a half hours after it started. Ordered the 8 gig, but it said 7-8 weeks to get it. I ordered the 16, and an hour later cancelled the 8. Weird since it was supposed to be gone at that point. I’m trying to buy the 16g from the Google Play Store, but every time I enter my address, it disappears, as if I never entered it. Any advice? I want this phone! Thanks.